If you don't have a commercial VMware license, and instead are using a trial, free, or EVALExperience ESXi 6.0 or ESXi 6.0 Update 1, you won't be able to easily download the 6.0 Update 1b ISO directly. You're not entitled. Silly, I know. Worry not though, since this article has you covered. Takes about 10 minutes total. Basically you paste two commands, wait for the automated download and patch process, then finish up with a host reboot. 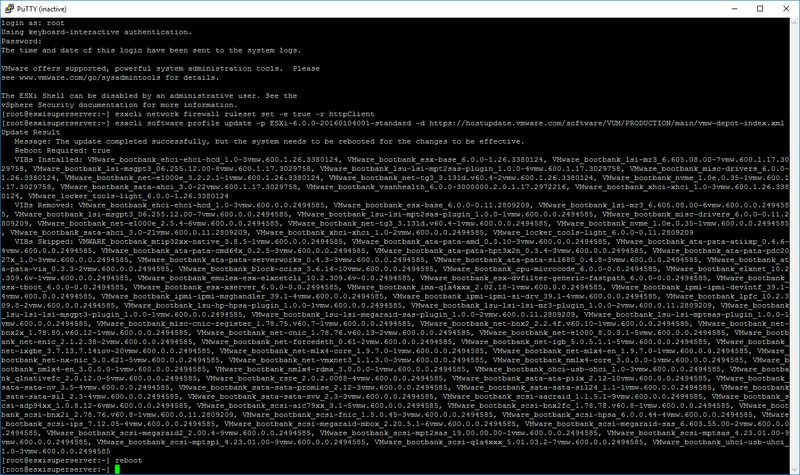 Here's how my upgrade from build 3073146 to 3380124 looked, right after the 3 minute download/patch. That's it! When the reboot is complete, you'll see for yourself that you now have the latest ESXi, Build 3380124, as pictured above. Now you have more spare time to read more TinkerTry articles! How to update your VMware server to ESXi 6.0 Update 1b the easy way! Just in case it's of interest, right after my successful upgrade from ESXi 6.0 Update 1a to Update 1b, it echos all the VIBs that were installed, removed, and skipped. Figured I'd do a cut-and-paste for you, right from the PuTTY session you see pictured above. Just in case you're upgrade-curious, and wondering if your driver package would be touched. and many other NVMe articles. You'll see a comment by willbill below that he got the free version of the ESXi hypervisor successfully updated to 6.0 Update 1b, using the above "easy way." This is good! For folks using the free version of the hypervisor, you are able to get slightly back-level version of the vSphere Web Client from the VMware vSphere Client download site that doesn't require login. Thanks again, willbill! 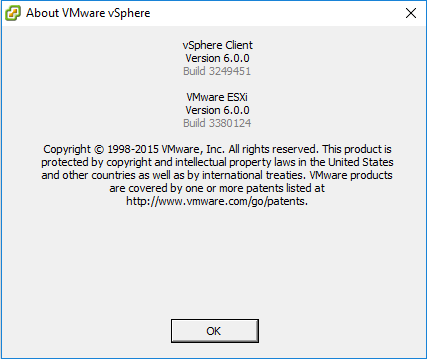 Notice also that you have the Download vSphere Client for Windows link when you point your browser to your ESXi server, but it just gets you the slightly older VMware-viclient-all-6.0.0.exe which is product version 6.0.0.6376.